Our laboratories are located at the Department of Chemistry and Biomolecular Sciences at the University of Ottawa. 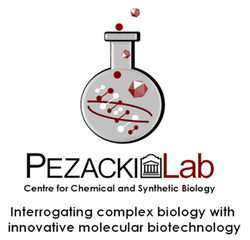 The Pezacki Lab is a multidisciplinary environment where students, post-doctoral fellows and professional staff work together to develop new chemical and biophysical tools for studying living systems. We have state-of-the-art facilities that include a chemistry lab, microbiology lab, and a cell biology lab as well as access to outstanding world-class infrastructure through the University of Ottawa’s core facilities.